While Wednesday’s debate was shorter than the previous two, it was not without its share of excitement. Between the candidates’ vicious tone, the lack of control by CNBC’s inexperienced moderators, and the sometimes shocking answers, there was a lot to sway movement on the markets all night long. And yet, when push came to shove, only two candidates emerged with any real shot of winning the debate, and they just happened to be the two candidates who won the last two debates (and who we had forecasted to do well that night): Florida Senator Marco Rubio and CEO Carly Fiorina. Rubio entered the night as the clear favorite, up 10 points over the nearest competitor, while Fiorina was tied with two other candidates for second. 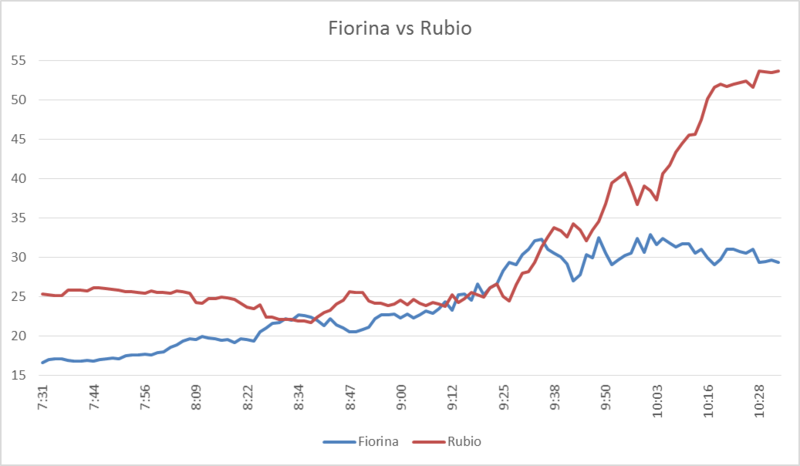 During the run-up to the debate, which delayed quite a bit inexplicably, Fiorina began to close in on Rubio’s price, and by the time the first question was asked was down just 5 points. From there she quickly gained on the senator, using her simple “get things done” message to win over the conservative parts of the internet and our traders. By 8:30, they were neck and neck and would stay that way for much of the night. They quickly surpassed the combined odds of the rest of the field, and by 9:45 the two combined for an over 65% chance of winning the debate. They had both proven to the audience that they were still the best debaters on stage and that one of the two of them would turn in the best performance. 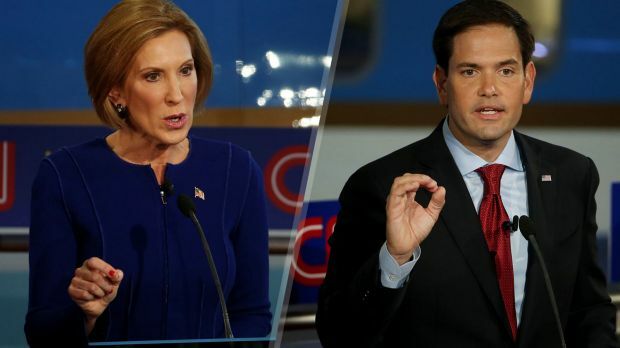 However, not long after that, Rubio began to leave Fiorina in the dust. Ten minutes later, he was past 40%, up 10 over the former business leader. Fifteen minutes later his lead had increased by five points, and ten minutes after that it had increased to 20 points, where it would stay until the final vote, which he won. Now, why this sudden swing to Senator Rubio? His performance did not improve that dramatically, nor did Fiorina’s slip. Instead, I think that the traders began to put this debate in the context of the question we ask our focus groups after each debate: Which candidate best improved their chances of winning the nomination? Fiorina may have won some people over, but she still had to compete with Trump and Carson for the outsider vote, which remains a difficult task. But after outdoing the likes of Jeb Bush and Jon Kasich so handily, Rubio is clearly the frontrunner for the moderate, insider vote. Though he and Fiorina gave comparable performances, his impressive performance will be much more damaging to his chief competitors, and that’s why our traders, and our voters, declared him the night’s biggest winner. Posted on October 30, 2015 December 16, 2015 by Noah	This entry was posted in Debate Analysis and tagged Carly Fiorina, Marco Rubio. Bookmark the permalink.